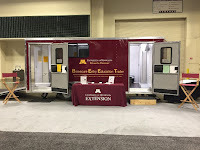 When visiting the booth, visitors could interact with members of the Swine Extension Team and get their questions answered about research application and available programming. Kevin Janni, Extension Engineer was available to answer visitors' questions regarding barn ventilation components and offer hands-on experience with use of the ventilation trailer. Sarah Schieck, Swine Extension Educator and Abby Neu, Poultry Extension Educator were available to interact with attendees about the BEET and its application as an educational tool for biosecurity workshops. Lee Johnston, Swine Extension Specialist along with Mike Reese, Director of Renewable Energy with the West Central Research and Outreach Center presented Electric and Thermal Energy Strategies for Minnesota Swine Farms highlighting their ongoing renewable energy research as it relates to swine farms. If you missed the presentations, click on Lee Johnston to view his presentation and Mike Reese to view his presentation. Thank you to Swinecast for making these educational seminars available.